This is a video of a protest I went to in Buenos Aires, in defense of murgas and street culture. A murga is a carnival performance group, usually attached to a particular barrio, and associated with the poorer end of society. A couple of weeks ago police attacked, allegedly without warning, a murga in a poorer barrio of Buenos Aires. Up to 16 young people from the murga group ‘The Authentic Kings of Rhythm’ were hit by rubber bullets, sustaining nasty injuries. The motive for the attack is not clear, but the police, as in so many places, have long been intolerant of poor kids using the street, and friends of murga culture fear this represents a further tightening of the screws. Partly their fears spring from wider political changes happening in the country. Argentina has a new president, Macri, the first outright right-winger for a while. His previous job was mayor of Buenos Aires and in that role he created a new police force, the Metropolitan Police. Curiously, the role of this new police force was not defined, and it appeared to do little for several years. Now Macri is president, and has made laws to empower his new police force, including giving them the power to stop anyone at any time to ask for their identity card. In a country still traumatised by a military dictatorship, the fact that a right wing president has essentially created his own police force is not comforting to the kind of people who ‘disappeared’ under the dictatorship. The fear doesn’t seem to be entirely theoretical: there are stories that seem to suggest that since the election of the new president the police are already being more aggressive and violent than in the past. It is in the context of the new police confidence that the repression of a carnival group appears important enough to call a large demonstration. 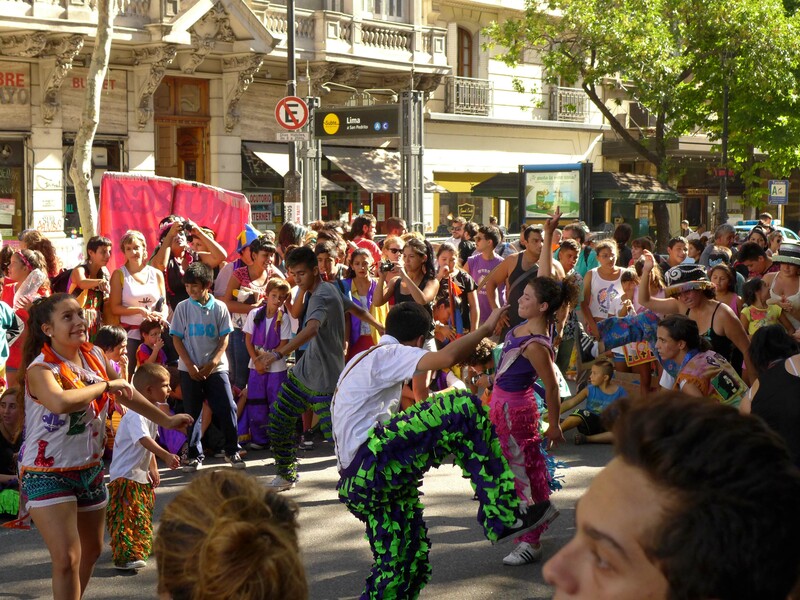 murga groups came not just from all over Buenos Aires but from other cities too. 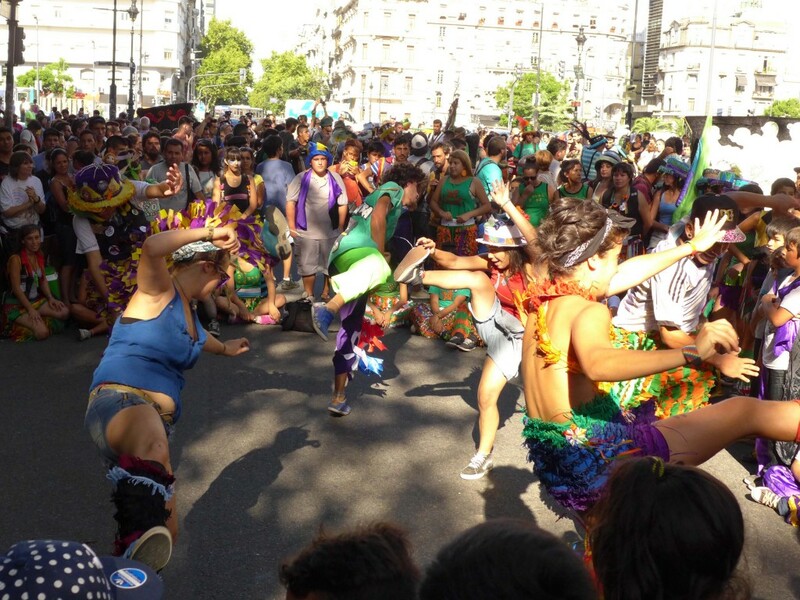 They marched and danced themselves to the Congreso Nacional to assert their right to be on the street, to be dancing and making noise. The murga performances on the march were followed by a few speeches. The mother of one of the kids shot by rubber bullets stood up and sang a song. According to the protestors, the murgas are an important expression of cultural identity, one controlled by the people, not the elites, a culture they make, not consume. 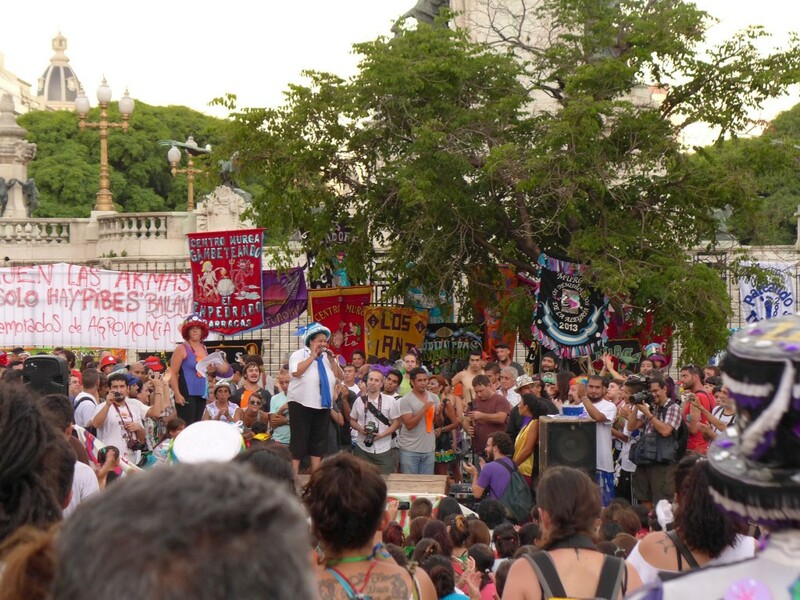 In Argentina, as in much of Latin America, left wing activists are not scared of talking about developing strong collective cultures against the status quo. They talk of people creating their own knowledges, about culture from below, about the deliberate formation of new collectivities and new forms of critical consciousness. So it is inevitable that murga culture is regarded as political. While every country has properly popular (as opposed to top-down television-imposed) forms of culture, in the UK and many other countries, it is usually seen as an old-fashioned, perhaps even kitsch thing. It would be good to think we could one day talk more openly about the political implications of cultural forms.